I left Idaho April 21st (nearly 6 mo and 10 days as the psychic had said) and delivered the art to Cody, Wyo. The second day of travel found me driving in snow and ice and the windshield wipers quit working. No wipers. The snow fortunately was light fall and the traffic in Wyo. was light also but when I got to Denver the traffic kept my windshield covered with water and I could not see the signs on the freeway. I ended up pulling to the side until traffic and my windshield cleared and then made for the nearest exit. I found a place to get the wipers fixed. $200 for a new motor and I was on my way again. I finally made it to Wichita for the night. Then I left for Oklahoma the next morning. Just after crossing into the state I hit the tornado warnings. The wind was blowing so bad and the wind was whipping the water on the windshield so that even wipers were no good. I tried to drive in it but finally found an overpass with no one under it and pulled over. Immediately about 5 cars pulled in right behind me. I sat there waiting for the storm to blow over and about got sucked out from under the over pass. This kind of unnerved me so I offered a little prayer and Wa-La.... The storm was over; the sun came out. And I wondered where the storm had gone. I mean like immediately it was gone. The rest of the trip to Oklahoma moved orderly. I stopped at the Cimarron Travel Center and showered and then drove on into Tulsa. Had a lot of trouble finding my new divorce lawyer as the previous one had declined to represent me after a visit from Jack. But once that was done, I drove to Quapaw where I stayed at Grandma Mandy’s. I had hoped to spend about 3 days in Oklahoma as I had a lot of things I wanted to do but I did not get away from Idaho as early as I had wanted. Now I was pushed to get to NY in time to set up for the first art show. I got to Oklahoma on Saturday and most of what I needed to do would not be open until Monday. I could not wait. Grandma had dinner waiting on me. Sister Susie cooked. We sat up late and talked. I had plans to go to Missouri on Sunday but early Saturday morning that changed. I picked up the 17 picture frames that I had ordered in Oklahoma, stopped by to visit Clan Mother Hazel Prewit and I was out of time. I headed to Missouri to pick up the art that I had left with my friend Jackie Warfel where I spent the night and Jackie and I talked until 2 AM. The next morning, I headed north to NY. 2 days later, I made it into Syracuse to Pam and Lou Rosetti’s, a super couple. David did not make it until the next day. I am excited to meet David. From our phone conversation, he is absolutely fascinating. Jack had been the most exciting man I had ever met.... But David.... He was truly spiritual with an incredible mind. And he was lonely and single. Things since then have been crazy. The first week I spent varnishing and finishing my frames, and putting my art in them for the art display at Ithaca, NY. May 6, David and I heard Masura Emoto at a book signing. If you are not familiar with his work, he is a Japanese scientist who freezes water that has been exposed to music, or words, or photos. Then photographs the crystals in the water as it melts. He has unequivocally proved the power of words, and thoughts. We bought a small book but it is fascinating. On the front of the book is a crystal from water that had a Buddhist healing prayer said. The crystal has what looks like a little Budda with a halo over his head in the center. Amazing work he has done. Some of the most important information to come to light at this time. This scientific documentation proves unequivocally spiritual principals that we have been teaching. Water is programmable, it has memory, and Mr. Emoto's work proves that our intentions, the energy that we put out, what we say , what we think, DOES effect and create our reality. Phenomenal information for those who need to "see" before believing. May 7 we also saw Shri Shri Ravi, a Guru from India. Interesting but I’ve had better meditations. David was given tickets and we got to sit in the VIP section with a gift copy of his book. Here I met Ranee Lapine. She had gotten David VIP seats. I liked her immediately, and it would turn out that Ranee would be our most avid supporter and an outspoken one too. Originals went on display May 8 at Ithaca, Foundation of Light for the Month of May. Here Laura Crow helped us with set-up. When the display was in place, the first time they had frames and hung, David and I were hit with the immensity of what was going on. The energy of the total display was incredible. David and I stood in the middle of the room and had our own ceremony… prayers, sage…. Awestruck at the way spirit had brought all of this together…. and wonderment at where it may go. 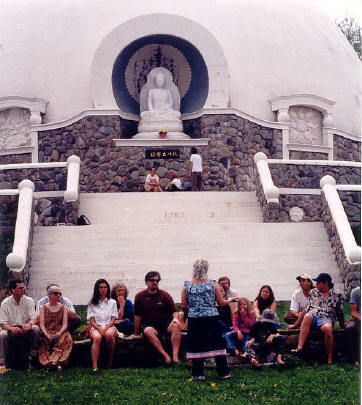 May 15 The third week, we had an outdoor display at the Grafton Peace Pagoda, just outside of Albany, New York, for Budda’s Birthday party held by Jun Yasuda on May 15, so we worked at creating a way to set the art up at the Peace Pagoda on Saturday. We got that done and we got set up just fine but a surprise shower got the display wet and the inks the canvas display was printed with, ran. We had to hurry and take down the display, about half were ruined. This display had cost me nearly $10,000 and now they were ruined. I went ahead and told stories there. What was done was done, and I could not do anything about it. The next two weeks were spent in washing inks off of the panels, hand lettering them and painting on the panels to fix the paintings. I lost only one panel that was beyond repair when I was finished. They no longer looked professional but but at least they are usable. The Buddhist Nun there, Jun Sun, was thrilled to see the work. She wanted to get my story and art printed in Japanese. She said that the Japanese people copied their constitution from the US constitution and that is the "enemy", the conqueror. She said the Japanese people need to know that their constitution really comes from the Native Peoples here. It would make them feel better. 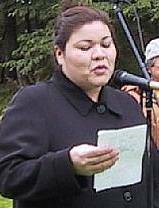 She also said that Arvol Looking Horse the 19th generation holder of the White Buffalo Calf Pipe is holding his World Peace and Unity at Tokyo on June 21 and that I should go. Well as much as I would love to $$$$$ is a main factor. Ithaca School Central Square Middle school where Pam Rosseti had set up on May 20. Then I did a 2 day presentation at the school on May 25, 26. It was a lot of fun. We are hoping to get more schools by the fall. Pam said the kids really got a lot out of it. Ithaca schools netted me $21, however what it meant in terms to the students is immeasurable. Pam Rosseti called to let me know how much it meant as some of the students awakened. Others were newly found proud of their Indian heritage. She said it was amazing what it had done for the students. I know they sat spellbound by the paintings and the stories. The rest of the school had gone on a trip and the ones I had were the "problem" youngsters. You never would have known it. They sat totally enthralled. Pam sent me a packet of "Thank you" notes from the kids. It was very interesting what the kids picked out to comment about. That Sunday, May 23, found us over booked. 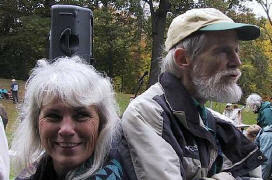 I had storytelling at Ithaca Foundation of Light, Ithaca, NY., while David had a Peace Festival meeting in Syracuse. We had stopped by Onondaga where David introduced me to Irving Powless, one of the Onondaga Councilmen, and had invited him to the storytelling as well has having gave him a copy of my story book. Shortly after I started the presentation, an Indian wearing his Haudenosaunee baseball cap and shades, came in with a pretty young Indian girl... the only Native Americans in the place. They sat with their arms folded across their chest. At the end of the presentation I answered questions. One question asked if I met any Onondagas yet. I told of having met Irving. After the questions were finished, the Indian got up and asked if he could take pictures, he had come with a camera. I said sure. As I talked to people, I saw that they spent a lot of time over by the Prophecy painting. Soon they came over to me. He said, "So you met Irving, Huh?" "When was this?" "Whad Irving have to say?" The woman with him is about to split so I know this IS Irving. He got a kick out of teasing me about this. I told him that he came in with the shades and then sat with his arms folded across his chest and I could not tell who he was. He said the arm folding was comfortable. I asked him how I did on the presentation and he said I did real good. May 28 My birthday was uneventful. David was going to take me to dinner and dancing but while I got ready, he had laid down and fell asleep. With his difficult body, I could not get mad. Only James and my Mom called to wish me Happy Birthday. Andrea and Juniper, her little girl, who rent from David, baked me a rhubarb Birthday pie and Juniper sang her "special" birthday song for me. I had been invited to Elder’s Celebration in San Francisco, Ca by Andree Morgana on May 29 but with my panels ruined I could not go. I am hoping for a rain-check on that one. Memorial day we spent near the Vermont border in a little town of Pumpernook which is a town of artists and ended with 3 contacts for future. One of David’ contacts, Christine is going to town. She could get me a date with Creedence Clearwater at their environmental shindig but we are already booked across the state on that day and I have not yet learned how to manifest myself in two places at once. We got a call this last weekend from One Love Press. Robert Roskind and his wife, have been doing "One Love Concerts" for Peace in Jamaica the last 4 years doing Bob Marley’s music. They have decided to start doing the healing work here in the states and the before mentioned Christine told them to call us. The next day, Joanne Shenandoah also told them to call us so they did. 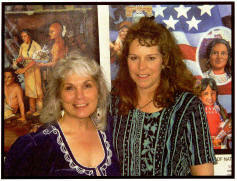 We are invited June 25-26 to do a Peace Festival with them for the Hava Supai in the Grand Canyon. David was going to put the tickets on his charge card but repairs on his vehicle came to nearly $2000 so we are not going go. So things have been busy here. I am nowhere caught up as I need business cards.... Idaho’s phone number is not much good here in NY and I need advertising. We need a second set of panels that are smaller and easier to handle. We did get two new gazebo awnings with sides. They were on sale so we saved $50. We’ve been working on a rewrite that will reflect the new information I have now. The other panels were done 2 years ago for the Winter Olympics in Salt Lake February 2002. David has not coped well with the travel and he is in a lot of pain. His temper seems to have gotten short, and he does not want me around. I presume it is cause of his pain level and he would prefer to be alone. I got to set up at the Onondaga Lake Partnership, Liverpool, NY June 5. 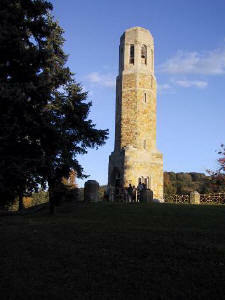 David had a Sacred Sites Survey that weekend too, and we plan on going to Watertown to see my son Richard. He is back from Afghanistan but is being transferred to Hawaii next month for 3 years, and it has been a year in February since I saw him last. I have not seen the new grandson at all, and Hazel was real tiny when I saw her. Otto is getting quite big and I think I have seen him only 3 times. Now that I am in distance to see the kids, the Army has transferred Rick to Hawaii for 3 years. We did not make either as David’s car went into the shop and they did not have it ready. I will be doing a show of the originals at Mohawk Settlement that Tom Porter has the end of July 15-30. Meeting him was fun. He promptly told me what I was doing wrong, corrected my pronunciation, and I thought "This is not going well" and I guess David had the same thoughts at the same time when Tom jumps up and says let’s do a show for you here. And I am thinking wow!!!! So the details are not yet worked out. This week end we went to the Dowser’s Convention in Lyndonville, Vermont June 8-12. One of my friends from Idaho, Frank Jordan was there too. Dowsers do more than find water. The convention was amazing. We had applied and told there was no room. Then there was room. Then there wasn’t room. Then there was. We did our first presentation on Friday night. David had worked for 4 days and 2 nights on a power point presentation to explain why he believed all this is important. It was impressive. We got a standing ovation from the people. One of them even got us a room and prepaid all of our meals for us. We ended up with $250 in donations people just gave us toward what we are trying to accomplish here. Saturday night I was given the okay to lead a short meditation to establish the Whirling Rainbow "virus" of Peace in the Vermont area and so the healers there would have it to work with in their areas of the country. It was something I was given along with 11 other people on the side of the mountain from the Watchers in the Sky when I went out to Salt Lake City, Utah in February 2002. I had wondered why I was one of the 12 but now I am given the opportunity to use this for the healing of the people and the world. The energy was powerful. People had been working on spiritual energies all week but this just pushed it up another level. People had stars dancing in their eyes. The convention made a sound track on CD. 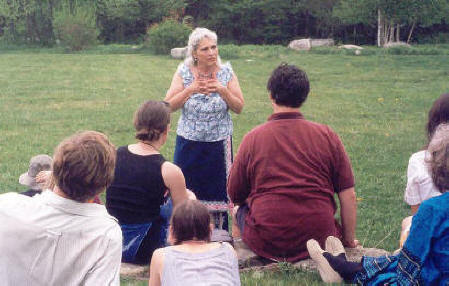 June 19-20 Spiritual Gathering at Tuscarora Nation (Same Weekend as Clearwater Revival.) The spiritual gathering was exactly that. It was not ceremonials or sponsored by the nation. Tahwahdahqui’s family hosts this weekend. People of all nations gather to do sweats and share spiritual information. Friday night one of the young people, Sean Kennedy, brought a Karaoke and it was fun to watch the young people, the children, and the ones who could really sing like Cherie Sardella. A lot of laughing went on. The next day, David had arranged for us to do our presentation right after the lunch and then David did the sweat and I sat and talked with wonderful women. Three meals a day were served and after supper that night, social dances were done. Some of the dances, I had not seen before but it was a lot of fun. Tahwahdahqui taught the dances in that morning but no one was worried about the form or how to do them right. They just had fun. June 20 Water Ceremony at Niagara Falls was way too early and cold for me but David went and took these spectacular shots. 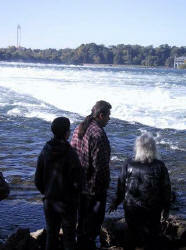 Early Sunday morning (5:30 AM) Tahwahdahqui’s brother took some of the people to the island near the Niagara Falls to do a water healing ceremony. David went but I did not. I had froze all night and had just barely managed to get warm and the thought of going so early in the wet cold spray just did not intrigue me one bit. Later, Tahwahdahqui’s sister came. She is a seer like John Edwards on TV and so we spent an interesting hour there. Then after lunch, we had our closing ceremony which consisted of everyone standing and telling what they had gained from the weekend and giving thanks. This was pretty emotional, then we met around the fire and did a round of hugs in the way of the Friendship Dance and it was time to tear down and leave. I set my display up, somewhat anxious as this was a presentation to Tuscaroras however, Jay Clouse, a very good looking (and married) Tuscarora told me that what I was doing was going to be good for the people. I commented that I thought the whites and the people of the world need to hear these stories and he said, no, he meant the Indian people... the Haudenosaunee need to hear them as too many do not know these things. He said he told the story just like what I had written. It was very nice to hear this. For me the weekend was emotional. Watching the kids have so much fun reminded me of when the kids would come to the Center to stomp dance, and it hurt to know that was over and how much I missed them. So even if it was a lot of fun, it hurt at the same time. 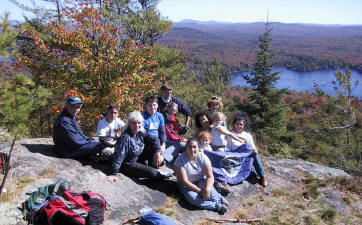 We will be going back on the 26-27 of September for the fall gathering. Tahladahqui, about the time David got electrocuted, had done a 21 day spiritual journey in the woods. I am not sure of the particulars but his name was changed from Boozer to "he who believes". Creator spoke to him and told him to contact David Yarrow because David needed his help. So he did, and David asked him to do a walk from the Tuscarora community to Onondaga Lake for the Peace Festival. The route will retrace the ancient path of war that became the path of peace. The car battery had run down so it was late Sunday afternoon by the time we got the display taken down and loaded then the car jumped. Sunday night we ended up at Sanctuary with a Mohawk, Mary (Red Corn Woman) and her husband Steve Aman, two more really super people. Mary is a masseuse in 4 techniques, hooks rugs and quilts. They live on a community farm of 700 acres with buffalo. June 21; Prayers for Peace at Onondaga, Lake. Also Peace Festival planning meeting. 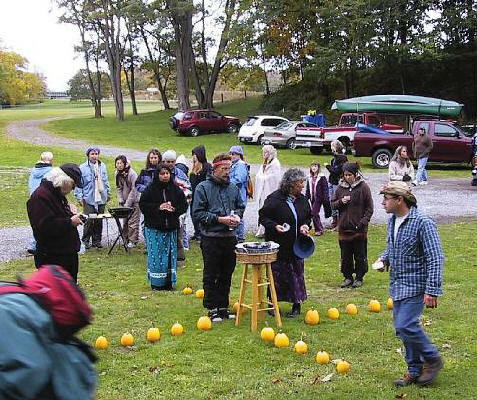 Monday, we had dowsing sacred sites and a festival meeting at Syracuse. When we went to go home, the battery was dead again, so one of the festival council members came back and jumped us and we got home to Albany at 2 AM. The ongoing controversy of using the two Jikohnsaseh paintings for the posters was finally solved. Some did not like the one with the flag because it was the "flag of the oppressor" and others did not like the one with the Hiawatha wampum belt because it was "appropriation of Haudenosaunee symbols". Personally, I thought "here was a chance to herald this incredible Native Woman, basically unheard of, a heroine for women and a symbol of the feminine energy and they want to get side tracked on the flag and the wampum belt. But since it was my art, I did not defend it. It was settled by choosing a different poster design for those who were objecting and David and I will continue to use what we have until the new design is ready. David went through a long explanation about how all this came about and what the purpose was of what we were doing and it helped to focus the posters where they need to be. June 22 Storytelling at Goff Middle School, Albany, NY I was back up at 6:30 AM as I had the Goff Middle School to do on Tuesday. There I told the story of the Great Laws 4 times before coming home. It went over very well. This was to 6th graders and 7th graders. Mark Walford, Assistant Principal did not get to listen but his teachers were giving him a good report. This is another story in synchronicity …how David met Mark. Seems that Mark found a belt buckle. He asked the farmer whose it was. The farmer said David Yarrow. Mark asked if he could keep it and he did so. 10 years later, he finally met David when he became Assistant Principal at Goff Middle School right across the street from David’s home. Mark is an incredible person. If all teachers and Administrators had this type of vision and integrity, our world would be a much better place. Mark feels a responsibility to teach the children in his charge things they will need for the future world. Therefore, Mark has put an organic garden and solar heating panels as part of the school curriculum. Mark found the belt buckle at the farm where David had been camping the day he was electrocuted. Everyone wants to know about David. He is a really special person. He was electrocuted by a high power line in 1992. He has been walking only a few years. His body is rather mangled and it is difficult for him to move and yet he pushes on. He is a very spiritual person saying that he took the "short circuit" to enlightenment which he really does not recommend. At that time the angels sent him back with a mission to accomplish. This mission is in connection with the Onondaga. And somehow this Peace Festival fits into that. He decided to do this Festival in December 2003 (same time I decided I wanted to tour with the exhibit) and after connecting with me on the internet in January, he invited me out in February to participate in the festival. He has spent 12 years planning and working toward this time in a knowing way. Much the same as I have been working toward this for 15 years in an unknowing way and both of us have arrived here at the same moment with the same goals, perspective and spiritual level/vibration. The mission revolves around two major entities; the Onondaga Nation and the energy of the land here, that David calls the "Dragon". The second part of it has to do with the Dragon. David has some pretty irrefutable information that were it not for the fact that I have been on the fringe of psychic and spiritual people for some 20 years now, that I would think was close to La La Land. The papers of his writings are over my head in the particulars but I understand and see the theory behind it. The land, the stones, the rock people are the record keepers of the Earth. Somehow when the Creator gave the original instructions, they were imprinted in the land, in the rock, stone people. When the Haudenosaunee departed from the original instructions causing the Creator to send the Peacemaker, not ALL of the instructions were returned. These instructions are in the stone and rock people, perhaps also in the DNA memory of the Onkwehoweh. There are many things that have been forgotten and it may be time for these to be returned. After invasion by the water people, yellow, white, black, the Mother’s cycles are all screwed up. David, I think, believes that the way to correct the weather patterns, clear the waterways, and heal the Mother is to awaken those perpetual energies and restore them to their proper function and original instructions. 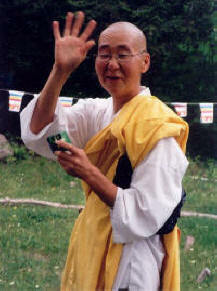 His studies center around the energy sites of forgotten Sacred Places. Some of the information he has put together is startling in their ORDER even though an UNCONSCIOUS industrial civilization has produced the present day sites. How all this will transpire, I think David thinks will show him when he gets enough information. As for my part in this... I have no clue. I am just telling the story of the Peacemaker and the Jikohnsaseh, the forgotten matriarch of the story, and going bit by bit. Another piece of information that I learned is about PHI and David has a paper on it too... way over my head but what I see in it is simply that there is a mathematical formula to prove that everything is made of God’s Love and this formula is called PHI and is considered Sacred Geometry. So much of what David tells me about all of this makes sense for a much more ordered world than I would have thought. I have seen the etheric grid field of the Earth but it did not dawn on me that as she as a living being, is structured and complicated the same as the human parasites that presently are cannibalizing her. She speaks, communicates, has energy vortexes in and out, but these energies that David talks about are more subtle and yet the crux of all future existence. It is at Onondaga that the Peacemaker created the Peace Confederacy which ruled for thousands of years. Faith-keeper Jake Thomas thought that the Onkwehoweh originated there and had the Laws of Peace possibly shortly after he beginning when Sky Woman fell from Sky World. But here also is where the Forefathers were inspired to reach for freedom and democracy and created (plagiarized) our constitution. Here also was the heart of the underground railroad that sought to free the slaves. And later, the heart and inspiration for the suffragette movement to return to women their inherent rights. This area is a birthplace spawning new ideas that go around the world. So it becomes obvious that there is truly some special energy imbued upon or within the land. We know that the Peacemaker intended for the Great Laws to provide Universal peace. This teaching was meant for World Peace. So David believes that it is now time for the Haudenosaunee to step up to the plate and begin the Peace that will go around the world as the prophecies state. How, when, if, is anyone’s guess. After 500 years of genocide in all manners, the Haudenosaunee are not too anxious to mess with others, let alone take leading participation. And really, no one can find fault with that considering what Native Peoples have been through. 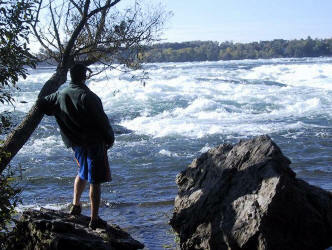 He hopes to find a way to ease this transition for the Haudenosaunee, the Onondaga, in particular. He hopes that healing of relations, the Indigenous Peoples and the New Comers will become a reality. Sometimes, David and I feel like we have stepped off of the known planet. There are few that I can discuss the full ramifications with as these implications sound like something out of a science fiction movie…. or worse. And I wonder if the Peacemaker, Hayenwatha, and Jikohnsaseh ever felt like what they were trying to do was from left field....la la land. In those days, people cannibalized each other.... today, we are doing it to the Mother. Some parallel. But at any rate, the one positive thing in common is the desire for peaceful earth. So, that is it. Interesting speculation and that is all. I don’t think David has really told me everything he knows or has been told. So I do a lot of fill in the blanks which means I could be way off base. Another thing interesting about this area in NY.... In Oklahoma we have 3 or more pow wows a weekend.... here they have Peace festivals, Peace meetings, Peace gatherings, all week long..... We went to the House of Mica Peace Chamber last night and did a South American ritual with the fire. Interesting. But good people. They have a South American Elder this Thursday but we will be on our way to Vermont for a four day dowser’s convention. David said he wanted to spend some quality time with other "weirdos" like himself. David introduces me and the door is open. There is no waiting for me to show or prove anything. The door is open and all I have to do is walk through. It is amazing the way people respond to him, to us. He has spent his life working for Mother Earth and for the People trying to teach them to take care of the earth and to heal their bodies with real nourishing food. He operated a healing center for a while healing with food. He has done Shiatzu massage therapy, organized organic farmers into NOFA, and now is working on Sea Minerals as the antidote to abused, overworked and impotent soil condition through natural means. He has never married because his work has pre-empted it. He lives meagerly choosing to serve mankind and Mother Earth. And I can see where women just do not understand his propensity to serve others on next to nothing $$$. He is white boy, 5’10". He looks like a refugee from a concentration camp, body in torture from the accident in 92. However, he reminds me of Merlin, the alchemy magician, and Obediah, the Prophet of God rolled into one. I can "see" a Confederate soldier as well. It is very hard if not impossible to see "Hiawatha’s brother" in him. He is a little younger than me. He is quite the person. He is a dowser which is the same as a "Water Witcher" and uses it to discover the lay lines and energy of the area as well as underground water. Ley lines are the energy lines of the Earth. He has discovered a 3000-year-old temple right behind the Onondaga headquarters. The history of the people says that there was a time when the people forgot their original instructions and that is why the Peacemaker had to come. David is acquainted with the dragon energies of oriental feng shui and he thinks that the temple and the energy of an area needs to remember the original instructions. 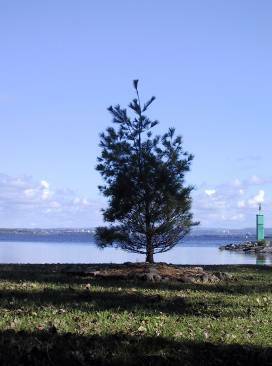 He has discovered that a village Kanenda of the Onondaga at the south end of the Lake Onondaga where the Peacemaker planted the tree of peace is on a direct line from the north to the south of the lake with the winter solstice. This is important as the people of long ago could watch the movement of sun and moon, calendars and ceremony times could be established. His presentation on this energy and its importance takes one hour but it lays the foundation for the work. One of the ladies in one of the presentation audience "saw" a woman’s figure in the topography of the hills. David had never seen this but it was OBVIOUS once she pointed it out. We are going to look at that closer. It will may emphasis the belief that here is where the Lynx became the Earth. Pretty wild stuff going on here. He is an incredible fountain of knowledge and experience. I am getting a crash course in a whole lot of stuff... Macrobiotic eating, sacred geometry, dragon energy, dowsing, and therapeutic massage to name a few. June 25-26 One Love Concert, Hava Supai , NM / We were invited to participate but No money to go to this one. June 25-26 Summer Festival Kanasiohareke at Tom Porter’s Mohawk settlement. I got into this just the night before. We set up on the condition that I not sell anything. The weekend went nicely. They loved my paintings until Sunday afternoon when I got a visit from Onondaga clan mothers. One had been in earlier while I was talking to someone else. We were still talking when she decided to leave and as she left I thanked her for coming in. She turned to me and said she wanted to speak with me. The tone of her voice said more than the words. I tried to finish the conversation quickly but it seemed to go on. I enjoyed this woman with the flaming red hair but I needed to find out what the Native woman wanted. I surmised it was Jeanne Shennandoah as I had seen her photo on the calendar at David’s house. Shortly after the red haired woman left, I had 3 women and 2 men appear in my display. The sweet looking matron (?Audrey) asked me where I got permission to do what I was doing. "Permission?" What did she mean? No one told me I needed "permission" and I had visited with Yvonne Thomas, Irving Powless, and Tom Porter. None of them said anything about "Permission". The older woman seemed questioning.... She said that I had things she had not seen or heard since a child and she wondered where I came by those things but she would not name specifics. Somehow I never really got to answer as I was informed that what I was doing was an affront to them and that I was told to quit until I could present myself to council. I assumed I had just been visited by an Onondaga delegation of clan members. David had told them I was coming. He had made personal visits to tell them about me. He had been trying to get into council since before I got there. Twice he had gone and sat and they ran out of time for him. So here he had tried to present what we are doing and were ignored.... so now they come, making me feel like a thief in the night, oh well.......... this work represents 15 years of my life. I was certainly not a "Johnny come lately white eyes". I take my new religion and way of life seriously, since my adoption in 94. And in my 15 years I learned more than a lot of Natives who took it for granted. This has been my life. It is the only thing I know. I could not put my life on hold…. there was no way to put myself in cryogenics or some other form of suspended animation. I could not wait as they seemed in no hurry. I hoped perhaps now with this "special" invite from the Clan Mothers themselves, things might move along a little faster...... but in the meantime, what am I supposed to do?…… this is what I came here to do…. and I believe what my purpose this time around is all about. I have a God given talent for painting and the paintings are given to me by Spirit... so there is a purpose, a greater plan, whether humans can see it or not......and it seems there are some that do not. July 3-4 RICHARD and kids at Loweville, NY. David drove me up to visit my son and his family in Fort Drum. We had a nice time. I got to see the new grandson. and to see the oldest one who looks so much like his daddy, my little one who is now so big. Where did the time go? How to God I wish I would have spent that time when he and the others were little in a better way. Well What is done is done and now we are where we are. July 10, A little sightseeing today as we visited the Institute of Ecosystem Studies at the Gifford House Visitor and education Center. July 16-20 This week, I have an original show at Mohawk Settlement on July 22, so I have been repairing paintings. I have been so careful with the originals but they have been scratched here and there. As well as fixing things that I just did not like anyway. It has been hectic and I am still not caught up with all I need to get done. New York is incredible beautiful. 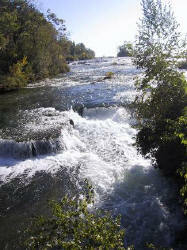 One town, Ithaca, has 6 waterfalls, two right in town. They are awesome to see things like that without riding hours to get to the high country. This area was formed by glacier and there are lakes and waterfalls all over. Also very cool this summer. 64 most times and rain most every week. But it is green and beautiful. I am learning a lot from David. He has served the Mother (earth) all of his life. I never heard of sacred geometry but it is very fascinating. It is the mathematical formulas from which everything is made. These formulas come to an irrational number called PHI. This PHI ratio is the mathematical number for LOVE > So this proves the spiritual law of organization that everything is made of Love, God’s energy. Very fascinating the way it works. I also am learning about Organic Gardening. I saw a PBS special today on how Native Americans have an Obesity epidemic along with other diseases. They actually gain weight twice as fast as other ethnic groups. And the scientists don’t know why. For being scientists, they are dumber than rocks. Oops Rocks are pretty smart but anyway. Indians ran a lot; they lived off the land NOT commodities. Again the governments "good intentions" have spelled doom for the Native American. All that white flour, sugar, and lard ain’t good for Indians (or anyone else!!!). They need fresh fruit, veggies, seeds, and meat. NOT Carbohydrates in the form of processed foods. Anyway, Organic Gardening and Community Gardens as well as food co-ops I am learning about here, might possibly be the answer to lupus, diabetes, and heart disease, as well as obesity among Indigenous Americans. They use to live to be 100+.... now they are sick before they are 40. Diseases they never had are now epidemic. Commodities are "dead" food. Commodities fill the tummy but give very little nutrition, especially the food value that Mother Earth put in food the way it was intended to be grown and eaten. Today, food sprayed with poison, waxed, dyed, and is picked early before it ripens. By the time it gets to the store we might as well eat the box it came in. This is not just a First Nations problem but a problem for Westerners as well. It is just that it strikes Indigenous Peoples harder because their systems were purer until recently. I am learning about Sea minerals. For instance, the sea has minerals in the same proportion as the human blood system. So when the water evaporates, all the minerals that have been washed from the soil into the ocean, now is in the sea salt. These sea salt minerals are the perfect fertilizer for abused and eroded soil. It is like putting the minerals that originally were in the soil back in. Use it heavy in the fall and it is a natural herbicide. Over the winter, the heavy dose kills everything but then seeps into the soil ready for planting in the spring. Use it lightly in the spring and you have the perfect growth additive. This puts the minerals back in the food and in the grasses that grow in the soil. The enriched food and grasses make healthier people and animals. No phosphates and nitrogen to get into the waterways with the rain run-off. Only mineral which means healthier streams and fish. A win-win situation. I am learning about Dowsing. That is like "water witching" except it can be used for a tremendous number of things other than finding water and water pipes. Learn to ask the right questions and you can learn almost anything that can be answered yes or no, directional, or numbers. You can dowse medicine, herbal remedies, how to find a lawyer, doctor, and dentist. Or map dowsing to find a lost child or person. Like I said you can dowse almost anything if you can ask the question right. I am learning about ley lines. These are one of the things that can be dowsed. They are like the energy lines of the earth and compare to the energy lines of the human in oriental acupuncture. There are spirit energy lines coming in from "heaven" to the earth and from the earth to heaven. These are called vortexes. Then there are energy lines across the land which influence what is built there and what goes on in certain locals. Using these energy lines helps to keep the earth balanced and the people in harmony. Most of our society today no longer know about these things and we have dammed up the energy, blocked it and done things to move it from its proper course and when we do that, we create pockets of poverty and drought. We have lived so unconsciously here on the Mother, that we have created some pretty bad situations without knowing it. Of course pollution and cannibalizing the earth resources figures into all of this too. I am learning about earth MOUNDS and mound building. New York is covered with them and they extend to Ohio and to Oklahoma. Again this is something that can be dowsed. Most mounds have a practical purpose. They served most likely like telegraphs. 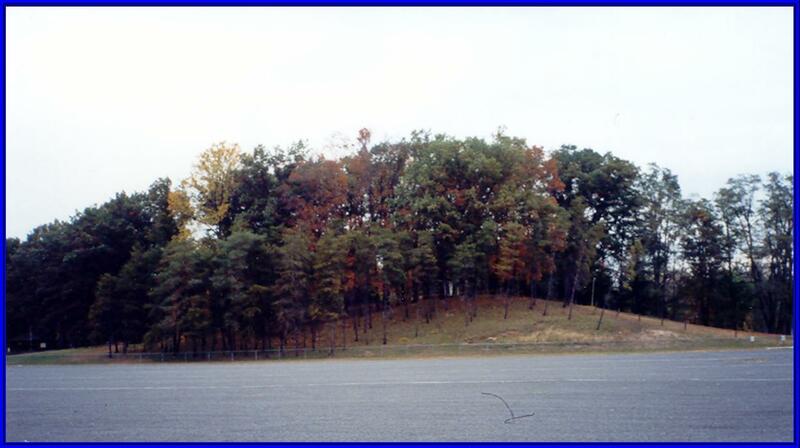 They are built so that a fire on top can be seen by other mounds in straight lines so that messages can be forwarded. Others are in line with the solstice. This enabled the people to create calendars and to know the longest day, the shortest day, the beginning of summer and of fall. Some of the mounds have religious purposes. They are built where vortexes are and may have 30 or more ley lines crossing at their center. Here "temples" were created to officiate the natural order of things. 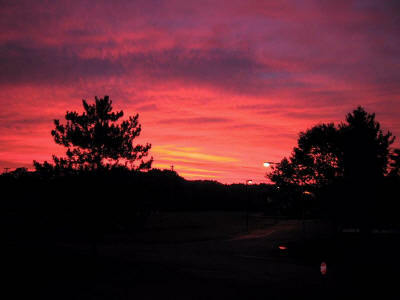 The Iroquois had similar ceremonies where they would "wake up" the earth in the spring. Most likely they were dealing with unseen energies and ley lines. I am also learning about Champion Trees. These are Trees that are huge. These trees are not necessarily real old. They take cuttings and seed starts from these trees and get them propagated in other places. Often they are used for "tree planting" ceremonies at Washington DC and the like. There is a state to state registry of the "Champion Trees" in each state. These trees are often resistant to diseases and blights that affect the smaller trees of their kind. So studying how and why these trees got so big is helpful. This is a Champion Butternut at Poughkeepsie in photo. Champion Butternut in Poughkeepsie, NY Me and the Champion Fred Begalia, and the Mayor tells how she as a concerned citizen got the community to save this tree from the developer’s saw. I am also learning about Old Growth Forests. These are places where they find ancient trees. Places where civilization cannot and have not encroached. The Boy Scout land in Wyandotte would have been such a place I think. They used to have these huge ponderosa pines in there but a couple of years back they logged them only to find that most of them were hollow and unfit for lumber. That should have been preserved. Jack didn’t know those pines were native to Oklahoma until he saw those. There were also "extinct" plants in there. Here they have trees anywhere from 500 to 1000 years old. Imagine what those trees have seen in their lifetimes, and what you could learn from them. So this is highly educational. What I will do with all that I am learning I do not know. But I have some grand ideas. July 22, Kanasiohareke, Mohawk Settlement. Originals At Kanasioihareke. When I went to Tom’s to set up for the show, I was turned away because of the situation with the Clan mothers. Now we have placed several more calls to the Onondaga but as to date they have not been returned the calls much less given us an actual acknowledgement of a date. I understand their resistance to answering is their way of saying "go away". I am given to understand the Wyandottes and the Seneca Cayuga of Oklahoma are no longer part of the Confederacy having something to do with the displacement and removal to Oklahoma. Even so, these are still their ways and they practice them today and so technically since they are not part of the Confederacy, the Onondaga do not have a say in their affairs. Still, the idea is not to cause additional division but to find a way to bring all peoples together, and since it was never my intent to invade Onondaga "territory", I will continue to seek a remedy to this situation. With this show cancelled, there was not time to fill the slot so I used the time to paint a new painting "The Origin of Wampum". July 31 Democratic Convention another disappointment. It looked like rain all day and the forecast was for rain but we had more people in the vendors than we did in the stands. One interesting exhibit was from a photographer who had photos of Iraq before Mr. Bush’s war. Photos of people like your neighbors. One of a precious beautiful little girl peeking around her father’s sleeve. The title of the photo exhibit was "The Face of the Enemy". Suddenly the feelings of this is the 22nd Century and we are still killing the innocent…… when will it stop. These photos could have been taken in any of our neighborhoods…. Why are we destroying their lives? What if it happened here? For centuries now, this country has killed children……. How can we so be so Holy and so right when children are paying the price……? Indigenous children slaughtered like animals. beautiful brown little babies....…. Now children in other places…. Children!!! When does it stop? How do we stop it? Momentary anger surges but inside I know the only hope we have is to stay in Love and reach that critical mass of 5th dimension consciousness that will swing our earth totally within the vibration of salvation for Mother as well as for ourselves. Mother Mary has stated that in that moment that all comes into alignment, the Earth Mother will heal completely. That is the only hope we have. August 9 Artist Reception and opening of Original Art Exhibit Open 4 PM to 8 PM at Boughten Place , New Paltz, NY. This was a very beautiful event with Rainbow Weaver, Mohawk, facilitating and Distant Eagle sang, and Donna did Thanksgiving address. Rainbow sees the spirit that is happening and did just a beautiful presentation and blessing. We had a very nice gathering of likeminded individuals. August 13-15 NOFA David and I did the display at National Organic Farming Association in Massachusetts. Again we were not on the program BUT I saw dancing which reminded me of the old renaissance period with everyone doing these gracious dances. 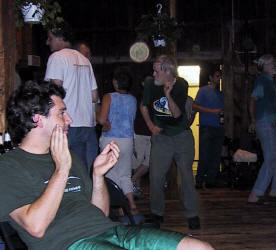 Then the next night we did Cajun Dancing. Everyone went wild. Never seen anything like it. It was crazy fun. David and I closed the place down. One of the last few to leave. I watched the booth while David listened to Ralph Nader debate........ and then he listened to Shriva Van Dana. I took off time to listen to a Mohawk woman, Rowen White, tell about the Indigenous effort to seed bank indigenous seeds. August 20- Dinner and Fund Raising This night turned out very well. We had some 40 dinner guests but David did a talk on sustainability and so I was just there. August 21-22 Nimham Pow Wow The first day here it did rain and rain. Nothing much happened. The second day the weather was beautiful. 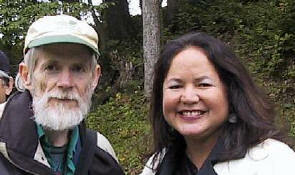 I met a young lady, Andrea Slater who had filmed Dennis Banks "Sacred Run" in Japan to commemorate Hiroshima and Nagasaki. I got one of the films. Good things like this happen and you do not hear about it until you run into a private situation. Where is the news media? What are people doing about peace and the earth? Actually looked like a Wannabe Pow Wow. But on Sunday more Indians were there. The head lady dancer was a blonde matriarch just stomping away what we would consider man style down south, in her buckskin. A Delaware woman dressed appropriately and dancing well was the only one I took up with. Most of the time I was at my display in the big barn. At least I did not have to worry about blowing away on Saturday during the storm. Sunday people were there all day, but mostly to talk. I told the story for 1.5 hours and the rest of the time just talked to people looking for their ancestry or a teacher or something. Late in the day, a woman came in. She heard voices around her like John Edwards of TV fame. Only in this public setting she could not distinguish who or what the voices. She saw one of my paintings and said " this is you. " I said hardly, that is a man. "But that is your face, your eyes." I said, "no that is my soon to be ex-husband.' "Then you are twin flames." "No not hardly, he has a new woman. He done threw me out and he’s got someone else. " "Well you should forgive him and take him back. He is really sorry and he wants you back. " Well nothing convinced her other wise and she stayed until 7:30 PM trying to convince me of this. This in turn made it very late by the time I packed up and left for New Paltz. I did get to see a Winter Solstice Chamber, a large oval dome made of stone that was some 4000 years old. It was on the side of the road with the trees and brush hiding it from the casual passerby. For the next three nights, David and I divided the time, with him giving a power point presentation and I tell the story. August 23 Remember Your Original Instructions August 24 Close Encounters with the Earth Mother, August 25; Transforming Warriors into Peacemakers. It turned out well. The best part for me was I had 3 whole hours to tell the story that I usually have to tell in 45 minutes so I got to tell a lot of stuff for the first time. We got mostly the same people for the three days. It was a good thing to try. Can’t say that it was that big a deal except it stretched David’s and mine working together and gave us all new experiences. I think courses in Peacemaking could be the coming thing. People cannot get along with family let alone the neighbor across the street. How are we going to create Peace with other countries? The problem is that whatever skills there are for getting along with others, how to disagree and still be friends, how to compromise, is not taught to Common Joe. Instead in our Western Society, our Pioneering Spirit, we have to be right... no matter what the cost. This cowboy attitude still pervades even in our Presidency of the United States. 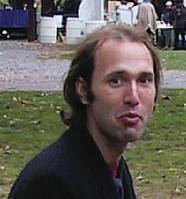 I believe it is Ian Xel Lungold (http://www.Mayanmajix.com) who expressed the thought that our minds would be rather be DEAD right than live. And so with this mentality, how do we create Peace? Boughton Place has been interesting. Claire Danielson has a multigenerational home based on the Catholic Worker Ethics while at the same time being entranced by the Peacemaker story. She also has Psychic Drama that takes place in the exhibit room. Clare is working on a maze that incorporates the vegetation of the ages of earth. There is always a lot going on here. Clare is a retired mediator. She has given me some information on conflict resolution and mediation. She believes in the restitution justice form of law rather than the punishment form and I have been coming to that way of thinking myself since seeing it on a Mohawk chat site. So with her experience, my thoughts have taken on a more solid form on this perspective. She gave me several books on Restorative Justice. In it I found some statistics that do not surprise me. It stated that 75% of those incarcerated are there for nonviolent crimes. Actually people that should not be in prison. It costs $60,000 a year to keep each individual incarcerated when some form of Restorative Justice would put these people back home, save the tax payers many $$$ and give these persons a chance to have a life. Now we put them in jail and when the term is up, they are let out with no counseling, or help for their problems until they repeat and then they are back in the system and the process starts over again. It is a crazy system that does not help anyone. This book validated that we need to overhaul our justice system as well. Yvonne Thomas, wife of late Jake Thomas, invited us to stay with her. She had to go to Toronto for exhibit as she continues Jake’s work, so we had the house to ourselves the whole weekend. Here I had the opportunity to examine her corn husk crafts. Actually amazing. All those years when my Grandma would feed the ensilage crew, I would husk the corn for dinner…. Sometimes making dolls hair with the silk on Grandmas holly hocks….and throw away the husk. And here are these amazing baskets, masks and things she can make out of them. When she got back she joined us down at the grounds and was very influential in getting the right people down to see the display. She was born Seneca but talks Mohawk. She was very helpful, and believing in the process of what is going on. David kept emphasizing that none of this … my paintings… being at Six Nations…… becoming friends with Yvonne…… would be happening if it were not for Jake’s stop at our Museum so long ago. I met an 80+ Elder, Miss Peggy Jemison. She had her "nephew" Cameron Stout escorted us around. Miss Peggy and Cammy sat for some time in my display and then the story came out. Miss Peggy had gotten ready for bed when Cammy stopped and asked her to go across the river with him. She declined at first and then got dressed. Upon arriving, my booth was the first...... and the last one they got to. After some time, Cammy said "you (ME) are the one we were to meet here tonight. That is why we came." Miss Peggy and I connected. It was Cammy that got me an interview with the local Turtle Island News. They took me to see the museum. They told everyone that I was with the Elders Summit and they let me in Free. I actually got to walk through a replica of the ancient style long houses. It was the most incredible feeling. I wish I would have thought and I would have tried to spent the night in one. The energy, the feelings, were WOW. Cammy showed me all of the current long houses that are in use and my last day there, they took me to a Seneca Reading of The Handsome Lake Code and the repentance Ceremony. I was the best dressed Haudenosaunee there. The only one with beaded outfit, at least on this day. Miss Peggy and I walked hand and hand. There was something from long ago going on. We wept as we looked into each other’s souls. She reminds me of Grandma Mandy and Maude Smith, the way she would giggle after saying something funny. We laughed and laughed. We also went through the residential school where they shipped the children. Miss Peggy’s school was Anglican Church ran. She gave us the tour, telling us what rooms had changed and different events that happened there, most of them bitter even though she laughed. Cammy and Peggy took me by to see Hubert Skye who did my adoption. At first since he was not expecting to see me, I think it took him a minute but then I got 2 big hugs from him and he said he was sooo glad to see me. He had gotten sick the first day of the Summit and so was staying home with walking pneumonia. He still did not feel well but he looked good. Surprise Surprise... I also ran into Amber, Roberta White, from Oklahoma, and Josephine Sandy. Did not have much time to talk as all were busy. I heard this voice, "Aunt Marcine, what are you doing here?" so I turned and said, "what are you doing here girl?" Amber is going to school but was on her way to work at the cigarette factory. I guess Randy White is there now too, studying the ceremonial ways. I hope the best for him. He has struggled with the firewater demon, and I pray for him that he has conquered it and will now be able to be all that the Creator intended for him to be. Alcohol has cost our people so much. He will now be a strength to turn that tide. The summit was not what I would expect. The Indians were doing massage, reiki massage and into most forms of healing. They had come to trade latest information and techniques all bordering on what I would call new age stuff. But the spirit of Creator was there. These people wrote a declaration during their time together in conference and it is on the website. The summit took care of ALL the food and had people on go-carts giving rides to elders, and handicapped and helping people. We had events all day starting with Thanksgiving Address to some planned evening event at night: a play about Red Jacket, Joanne Shennendoah concert, and a social dance. It rained the first two days which were not good for sales, but I still made over $1000. Not being familiar with Canadian $ exchange, I ended up with $ 771 American Dollars. OUCH! Oh well live and learn. By the time the Summit was over, I could have had four suitors, one was a young lawyer that had never married and was exploring his creative side rather than go back to lawyering but it sounded as though he would have been very good at being a lawyer. He refused to give an oath of allegiance to the Crown (we are in Canada) and instead sited many reasons in line with the Good Mind and then gave allegiance to the Mother Earth. He was accepted into the bar 48 to 44. Those 48 were the ones that had heard his arguments before the bar. Course, I am not looking but it was a good ego boost. Here many others visited my art saying that this was good, it was what was needed. But the best for last. This was incredible. People loved my art. The Teachers want it for their class rooms, and person after person, recognized the true gift that it is and its source. I was very happy and please. I even had one Salish Seer from British Columbia get so overcome by spirit that she prophesied and ended up by bequeathing to me her personal pipe. An incredible honor. Yvonne was there and witnessed all of this and I could see that she understood what had happened. Some of this there is no words for. The English language fails at translating the looks and the energy flow of those looks... the love, the knowing, the belief, the acknowledgement... the desperation to relay. It was powerful. Before we left, Cammy and Miss Peggy had gifts for us. Cammy gave me several books. Later on the inside cover I would read scrawled in his hand "She Kon Greetings Marcine. When first we met I thought ‘oh boy, another Wannabe…. thinks they know. Now that I know you, I know you are the "real deal". So some things to help you on your journey. Onah Rakwiserons". Thank you, Cammy. September 2 Today we stopped by Taledaques, Tuscarora, after leaving the Summit Grounds. 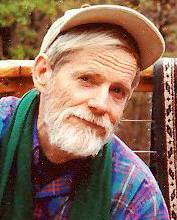 David and him planned the route of the Healing walk only it has turned into a canoe trip just like what the Peacemaker would have done. It will stretch from Niagaa to Lake Onondaga. I am thinking of joining for the last week of the journey. To see what it was like for the Jikohnsaseh. And to get a lot of pictures. A Mohawk, John Saradella is also canoeing from Askwesaskne. Talahdaque used to have the name Boozer but after 21 days on the mountain, his new name means "he who believes". Creator told him to help David so he is. John Sardella was born with the mask and he has died three times but been sent back. He too had a vision and David's project offered the fulfillment of this vision. I am kind toot their horn for them because humble people would not do that for themselves but on special occasions. 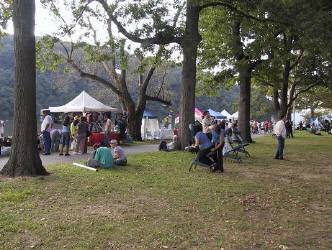 September 4 6 Woodstock Arts and Crafts Fair Three days at the hugest craft event I have ever seen, some 6 circus tents filled with the creative imaginations of human kind. Incredible craftsmanship, ideas, and products all hand crafted. It cost $500 a booth to get in and Claire managed to get me a space for 15% of sales. Of course I am more educational than profit. I enjoyed looking at all the incredible stuff. Jewelry, the high dollar stuff, bead and stone jewelry, hand crafted beads, hand crafted clay flowers taught to the lady by her Grandmother in Thailand, inlaid furniture, art novae mirrors and wall decorations, custom made clothing and designs. And on and on. I did ok here. So now I have some pocket money. Hall mark of the event was when a Chinese girl was "pulled" in from the corridor and asked if I had anything on White Buffalo Calf Woman. I showed Donna HoLighct my painting and she was overcome by spirit. BCW is one of her guides and so this rapport immediately developed. She took a brochure. She is a beautiful girl and calls herself a spirit healer. The work she describes doing is the same as I was taught by Karmin, Frank, and Jane. On the brochure she saw that I was storytelling later that night and so she came. After the storytelling, she listened to David’s presentation and it was 11:30 before she left. Andi and Margo joined us also for this impromptu get together. 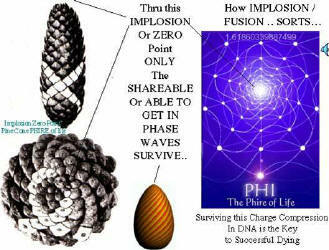 Donna HoLighct was into the sacred geometry and she showed us one way in which she works with the vesica pisces. It was one of those wonderful evenings involved in spirit. I loved it and wished it would never end. September 7 Today Claire and I went to the Mohonk Mountain House for breakfast. We walked the grounds and I took pictures. Just 10 minutes from New Paltz/ Paughkeepsie New York. In the fourth generation of ownership with the idea of conservation in mind, my pictures did not catch the grandeur of this place. Still furnished from the turn of the century, the Mohonk Conservation board of which Clair is a member, has acquired 5000 acres to keep in conservation. As we walked the trails, the hemlock has the sweetest evergreen smell, heavy in the air. Unfortunately, these are only a few of the photos I took and there is no way you can see the grandeur of this place in them. The way the lake sits in a basin of cliffs with this incredible montage of buildings and construction and gardens on the edge of the lake. One day I would like to do a presentation there. They are the right kind of people……. By that I mean people interested in the Earth and preservation. I wish I could have seen one of the rooms where people could spend the night…I wonder if it is still furnished from the last century….and what about ghosts……. On the way home to Albany, David stopped at Rainbow Weaver’s in Woodstock. Always a wonderful feeling and exchange here. Rainbow does not have a lot in possessions but she does a lot of schools and teaching and is looked at as a "teacher" in this area. I was impressed with the beautiful ceremony that she did for me at my reception. Before I left, she gave to me a little white drum key chain that she had made. What she said as she gave it to me, overwhelmed me. She said that she believed that the work I was doing with the paintings was nearly equal to what White Buffalo Calf Woman did when she brought the pipe to the people. That is a totally overwhelming thought, as I don’t even feel in the same league, but I am grateful for the encouragement. 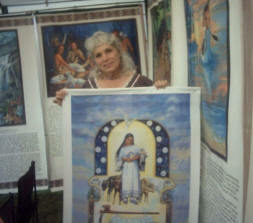 I am thrilled when Spirit speaks to people through my paintings. That is truly the highest compliment and source of validation there is. September 9 Syracuse, Today we have to leave for a festival meeting tonight. Don’t really want to go. It is our plan to paint a picture of Leon Shennandoah and give it to the Onondaga Council House as a gift and in honor of the Tadadaho as Peacemaker. However, I need some painting time and I see that we are getting even our week days filled up. September 10 I rode with David while he did Festival business. One of the things we did was to hand in a letter to Onondaga councilman Irving Powless, asking to see the council. See what happens now. 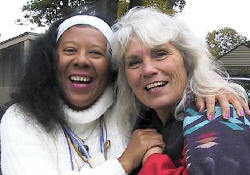 September 11 Prayers for Peace, Lake Onondaga - Madis Senner facilitating. Several spoke but Madis spoke on the oneness of the world as the entire world for one day was an American as the world held prayers for the victims of 911. Many of us sat and talked for a couple of hours and then we adjourned to John and Barbara Parkers where we listened to April Love sing with her enchanting voice all evening. We also viewed the Crop Circle DVD That David and I got at the Dowsers Convention, sharing that incredible information with all who are ready. To find this on the net and to order one, go to www.Stardreams_cropcircles.comrecommend it highly as you will want to share it with everyone you know. September 12 Sweat Lodge at John and Cherie Sardellas, Parish, NY Today we went over the route John and Cherie will lead on their journey to Onondaga Lake. 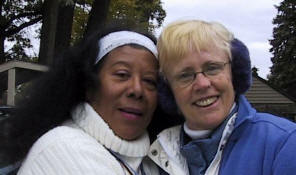 Cherie shared that her friend in the Catholic Church has found support for their walk through her church. Wonderful. They will help with money, food, and Cherie gave them a list of other things needed. September 17 Earlier this week, Kalis UpRichard arrived and David and I picked him up at the bus station Sunday night. He had been visiting a farmer in Colorado when he heard of David and this peace festival and called to make arrangements to come help. The young man did a lot of stuffing envelopes but when he wasn’t doing that, he cleaned cupboards, refrigerators, and kept us fed. He left Saturday with plans to be back by October 6. We left Albany a little late on Friday and arrived at Pam and Lou Rosetties at 9. As I walked in there was a drumming session led by John and Cherie Sardella. They were singing the song with the refrain, "we thank you for the Mother". John Sardella later made mention of how appropriate this was as I came in. (?) Most of these people are not that much younger than me. Pam and Lou are 50 they just look 40. Both David and I with our white hair could easily pass as parents of our little entourage I suppose all though I do not believe that it was age he was referring to.... But more how David is the founder, the visionary, the peacemaker, and I become the mother of this effort and movement. I accept the acknowledgement gratefully. When David came in they were not singing but quickly they began " We are thankful for our leader." It was funny, but at the same time, in retrospect, very timely. I have never been to a drumming circle but if they all were as much fun at this one, I would never miss. The energy in the room was electric. The laughter epidemic. John and Cherie lead sweat lodge and John is Mohawk so there were some authentic Native songs sang. It was wonderful. John went to great lengths to tell us about the sacred Micmac song, the only song left by his mother's people. When the mood was set with proper respect for this ancient traditional song, he began the chanting of Ya, Ya, Ya, to the tune of the Flintstones. Someone else quipped that was so ancient it was a real ston eage song. More Laughter. 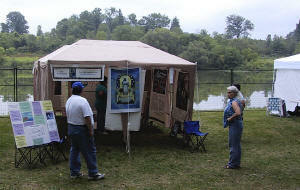 Sept 18 Today was the Hindu Hodenosaunee Conference. Yashi who organized this conference reminds me of Ghandi. Of course I never met Ghandi in the flesh but I fell in love with this diminutive man. His quick smile and laughter. Even though they often spoke Hindu, I never felt self-conscious about it, feeling their enthusiasm and quick wit and laughter. Everyone had to shorten their presentations. Mine flowed beautifully. I impressed myself with how well it went. David excelled in his also. They served Indian food which was very spicy and curried. Everyone was very nice. They invited me to participate in the youth conference at Buffalo the next day. By the time we got the paintings down, we were the last to leave the conference area. It was a small conference. Taledahquay also spoke. Jake Swamp had a death in the family and so did not come. Terry Mc Masters came with Kelly, she is an Onondaga. That night they took us to Hindu Temple. It was Elephant Boys birthday so we got to see quite the celebration. All the women in their beautiful Saris. One of their customs of slightly bowing with their hands in prayer position means "I honor the God in you". Beautiful custom. Inside this temple because they are in the states and do not have the availability to many sites, the temple had many Gods AND Goddesses in there. These gods and goddesses are their cultural heroes and sacred people. They have elevated to them as Gods as we are all gods. They have Great Mystery over all, the one BIG god and then all these little ones. This temple had 14 I think, all dressed in beautiful clothes, with jewelry and crowns for the celebration. Only one god was not mated, and this was the Elephant Boy whose birthday it was. They took food, blessed it and presented it to the "Gods" and when finished the food was served to the people to partake of. The walls were filled with the beautiful paintings of their Gods with the beautiful smiling faces. Often I had wondered the story behind such paintings and now I know. Sabitha gave me a personal tour and before the night was over, we sat up and talked until early morning sharing. Sept 19 Next morning we went to the Youth conference. Here Sanjay separated the parents from the youth and then role exchanged. The parents had to be the kids and the kids the parents in a very lively exchange that really set the tone for the conference. Once again Shakir gave up his talk spot in order to make room for speakers. My 45-minute talk was cut to 20 but I guess I did alright. The auras of the people danced they were so bright. And the youth were sharp. Anyone would be proud to have them as their own. Close your eyes so you could not see these Hindu Indian children and you would have thought them to be middleclass US of A. No accents and the concerns are the same. 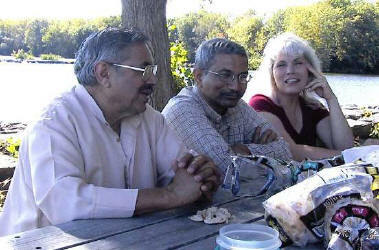 Shakir, married to Sabitha, and Sanjay took me to Syracuse after the meeting. We talked and talked and became fast friends. 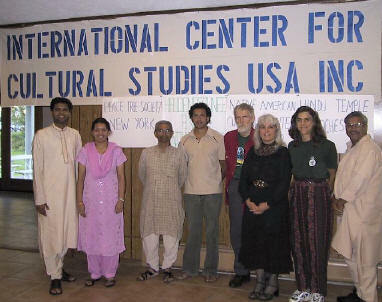 I have been invited to attend their world conference in India in 2006. Shakir said they did 5 conferences a year and he would like to have me and David attend as many as we could. It was fabulous exchange as we realized that so many of their customs and beliefs were the same as the Haudenosaunee. They said they thought of me as one of them. They hand not found anyone they could relate to as well. With the conference over, they now would have to drop me off at Syracuse on their way home. We talked all the way.... all four of us... as though there just was not enough time to say all that we wanted to say. Incredibly beautiful people. The first thing we knew we were at Pam and Lou Rosetties in time for the Festival meeting. I brought the real Indians in and introduced them. People lined up to introduce themselves and hug these new friends. I was still flying pretty high from an intensely incredible experience. David’s meeting went well. People are coming together. Good we only have 3 weeks left. I had a few minutes to speak with Kelly the Onondaga as she accompanied Terry to the festival planning meeting. She invited me to stay with her a couple of days if I could. She wanted to discuss more about the issues facing the People. Sept 20 It was afternoon when we left Pam and Lous. David had several stops to do festival business. We stopped at the Food Co-op and spoke to Joanne extensively. Then David made another stop. Bored I got out and snooped at shops. Noticing the Seven Rays book store I went in there to look around. There David was talking to David the shop owner but Sue and Shelly were there and son of Cherie Sardella, Carl was there. Sue took me to the back room. She explained that she had been doing prayers in Buffalo Sunday and several things came to her. We went into the healing room and she began to channel her poetry. I wish I had a copy of it. But as I recall it, she was doing some work for Mother Earth and she had me stand in proxy for the Mother. She said that David and I were the twins which I don’t understand but that we would be the bridge to two worlds. White and Red??? 3rdand 5th???? It was all very spiritual and very metaphoric. She said I represented the Earth and walked the path of the Mother. Interesting. Then we stopped at Spring Farm where we have another presentation coming up in 2 weeks. By the time we got to Albany it was 9 PM. Sept 22. Don’t know what it is about being back at David’s. Last week the same thing happened when we got back. Now today, my body hurts, my stomach is eating itself, my head aches, and I just went back to bed until 1 PM. David had a bad night also. I could hear his groans and verbal outbursts all night even though he sleeps down stairs. Sept 23. Thursday, Feel great this morning. Took care of emails trying to get orders filled. And now I am going for a walk/run in the woods. Then onto my painting until David tells me it is time to leave for the weekend. Tonight we go to Utica to stay with Christine Shahin. Tomorrow we got 2 schools that she has lined up. Tomorrow night, Andi has an engagement at the Coyote Wilderness School in Vermont. 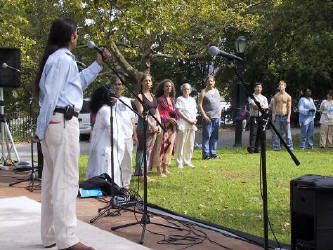 And then to New Paltz, and on to NY City to set up early morning for the One World Unity Festival. Then when that is over, it is a long drive from NY City to Niagara to the Ek Way Hey Way gathering and seeing the Peace Pilgrims off Monday morning. Sept 24 Canada Middle School gave me 5 classes before noon in 20 minute segments... I did it. I did it. But my throat was tired and scratchy when I finished projecting to a room of some 70-80 kids each time. The kids were great as usual. Then I waited for David. He was working on the computer and did not come to pick me up until Christine’s husband Steve had to leave so it was quite late when we got away from there. David stopped at Mohawk Art Center and Spring Cares Farm to clarify the upcoming events. It is quite late when we get home. About an hour and half and then we left for NY City, staying at Boughton Place for the night and then onward. 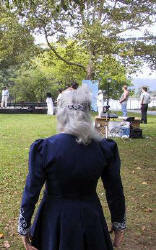 Sept 25 Upon arriving in NY City, I realized that I had left my set up at home so I strung a rope through the panels and hung them on the baseball diamond fence. The festival turned out to be quite small, more venders and artisans than visitors. We did meet face to face the Roskinds of the ONE LOVE movement of Bob Marley. Exuberant good folks. I got sick. Sick. My stomach began with intense pain. Oh what fun. Needless to say, I did not do anything at this festival. David on the other hand had some young kids walk up to him and say they were told to meet him. They spent nearly the whole day with David. Turns out that this may be why we made the effort to go all the way to NY City for the One World Unity Festival. 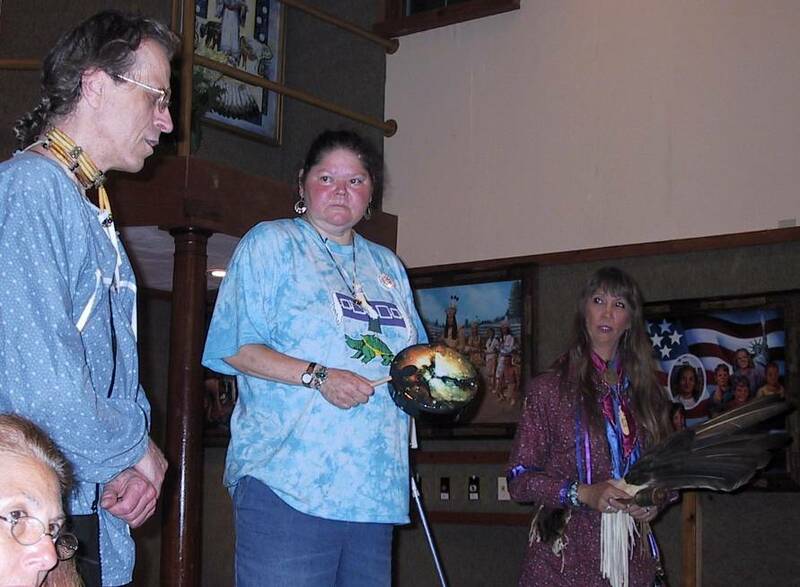 Seems last summer that Bruce and his wife Stacy had gone to Hopi country in Ariz. As he drove up to First Mesa, he was met by an old Hopi man who said, "We have been waiting for you…. I go pack now." 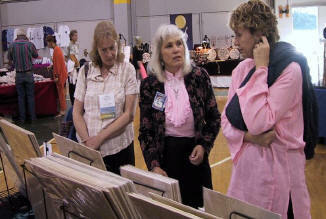 While they waited for the man, they visited with the vendors there. One of the kachinas had some symbols on them that Bruce recognized however when the woman told about the meaning of the designs on the dolls, she skipped over the familiar ones so that Bruce asked about them. He was told "We don’t talk about them." And they were sent to the woman’s brother, who just happened to be the man packing his bags. When Bruce and his wife caught up with the old man, he was packing his second bag. So Bruce asked him about the symbols and was told "We don’t talk about them". Then they left for a 2 week stay of ceremony and instruction from the old man. Seems that Bruce when he was 14 discovered a stone in Connecticut that has these symbols on it. As I understood it, he was the lost white brother that has the lost stone of the Hopis. I do not know if arrangements were made for Bruce to return it. I hope that we may be able to spend some time with the kids when they come to the festival on Monday. We packed up here and I was grateful when we finally got home. The acid in my stomach had burned clear through and my skin was raw. Sept 26, after some rest and clean up we left for Niagara. Taledahqui had a sunrise service scheduled and David wanted to be there for it. We got there and slept in the car until day light. 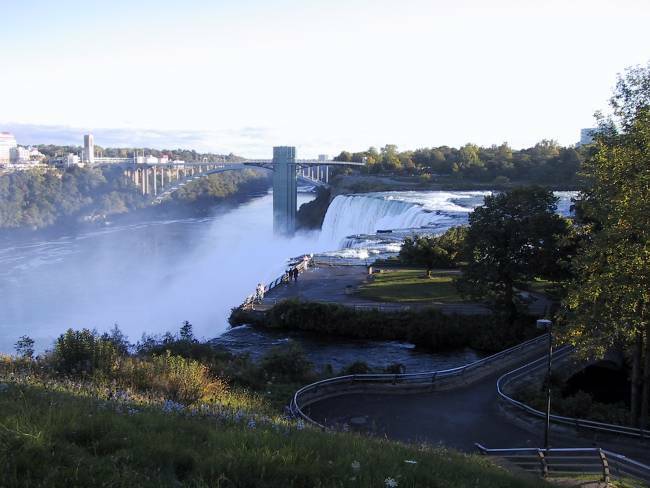 I got out and took pictures of Niagara Falls. As I returned to the car, David was waking up and so we went to Tuscarora Nation to Ek weh Hey Wey. They had done their ceremony without leaving. Here we had a laid back day. I still was not feeling too great so I did not socialize a lot but by evening was feeling fine. Sept 27 This morning we went to Goats Island, above Niagara Falls to get water that the Taledahqui walking group will take to Lake Onondaga. We did a small tobacco ceremony and then left for the walk. 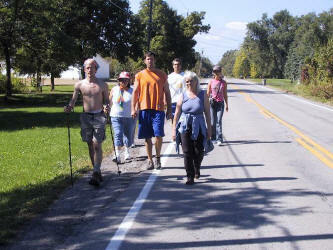 When we got back to Ek Weh Hey Wey, we started walking the 15 miles to begin the Peace Pilgrimage to Onondaga Lake. I could not find my tennis shoes and so I walked in my sandals expecting to just go a few miles. Instead I walked all the way with everyone. There was 8 of us. I wanted to understand their sacrifice to carry prayers and water in this manner. I wanted to feel the sense of accomplishment of having finished the 15 miles. The last 4 miles were agonizing. But I kept thinking I would regret it if I did not finish. We laughed and had a lot of fun. David followed behind in the van so we took frequent breaks for water and food from the Van. At one point we saw a mother raccoon and 5 little ones scurry across the road. She went first followed by 3 smaller ones then we saw 2 more pop out of the roadside weeds and we cheered them across the road before any cars came over the hill. We also say a garter snake. It took 8 hours and as the evening light began to fade, the mosquitoes came out in a hungry welcoming party. Bonnie and I lagged behind. We reached the top of the bridge over the canal just as the last light was turning the water in the canal pink. Sept 28-OctobeOctober We are home and I am completing the painting of Leon Shennendoah. I worked 2 nights once until 5 Am and another until 3 am to get it finished. 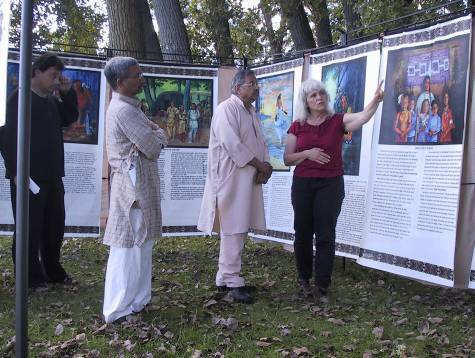 October 2 , We met the Mohawk Peace Group at the Peace Pagoda at Grafton for the celebration of Ghandi’s 135 birthday. They were supposed to speak but that did not happen. They did meet with Jun Yasuda. After eating, the rain started and so we left. There was a Native Man who gave a prayer. Turns out he is vision questing with Steve Aman this next weekend for the people, and the return of the Sundance to these parts. We also met three world walkers, Natalie from Australia who did a dance from down under that the slaves would practice in the fields to get strong for an escape. She called it a slave dance but said it was actually a freedom dance. Very interesting as it had to be done low to the ground so the overseers could not see them practicing it. Also met Oko and Taka from Japan. These three would join our walkers and canoers to the festivals. Oko is very quiet not knowing any English but Taka, quickly began giving jest as much as he took. October 3, We met John and Cherie Sardellas group at Tom Porters at sunrise for the shove off of the Eastern Peace Pilgrim Walkers and canoers. Then we drove to Little Falls and to Christine Sahins where I joined the Kids Against Pollution for a hike up Old Baldy. It was quite a view. After an easy day of enjoying the smell of pines, the sun on our faces, and the incredible view as you looked out over the valley from the top of the mountain. 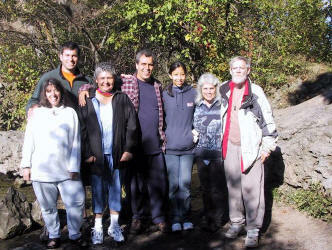 Then we drove back to Little Falls for the evening with our Mohawk Peace Pilgrims. We had a pot luck. They announced, "Elder’s First" and as I look around, they mean David and me. OUCH!! Heheehe, me an Elder! And then we spoke to about 40 people at the Boat Launch. It was getting chilly and I got quite cold there before we moved inside. As always David did a great job and I got to tell the stories. Then we asked the walkers to share some words as to why they were doing the walk. The surprise of the night was Brent, the only Onondaga in the group, as he spoke a lot of good words. When everyone was gone, we took down the art display. The moisture had condensed and we had to put it in the boat house for them to dry. Tom the owner was very gracious and so nice about everything we needed. 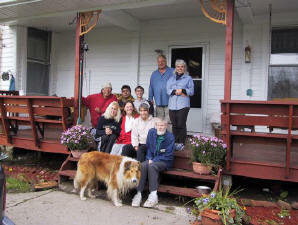 October 5, we stopped by Vince at Onondaga and visited for a few hours. He was very nice and very congenial. He brought out his condolence cane to share with us. His cane had been made by Jake Thomas. Then on to Spring Care Farms for another Pot Luck and presentation this time with the Mohawk John Sardella and Cherie group. By now, it is obvious that I have a cold and my voice sounds possessed. However, when it is time to story tell, it clears up and I do a great job again. Several of the audience visit with me and comment that it is as though I am telling MY story, as though I become the woman in the story. INTERESTING. Goodness knows, I can definitely identify with Sky Woman; she lost even her world. And had no one at all until baby Lynx was born. What pain was in her heart when she was so totally innocent of Sky Chief’s actions. I can definitely identify with losing everything… material wise. 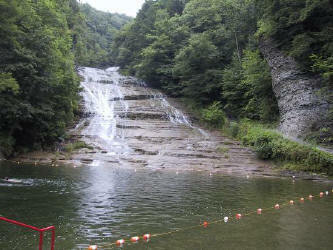 Walkers and canoers added Nat(alie) from Australia, and Yoko and Taka from Japan. Onondaga Brent is eager to offer me some pointers on the story. I am grateful that he wants to help me and is willing to share but a lot of what he tells me I know. I just don’t have time to tell everything, or no one would ever get to say anything. LOL This finished and now we go back to Albany. October 6. Kahlis arrived and we were sleeping so we did not meet him at the bus station. He got a taxi and came on out. David jumped up an hour later, got to go get Kahlis. I said he is here already. We both spent a lot of today in bed. I need to get over this cold. I worked a little on Leon’s painting and am getting ready to do the one of Jun Sun. I don’t really feel that bad just cough and hack. And sound bad. Kahlis is taking care of us, cooking and keeping me supplied with tea. October 7 - My Ricky’s birthday. I worked all night and have the painting of Jun Son finished. October 9- We have a festival meeting at 6 and we have to get to the airport no later than 3 in Syracuse to see my son and his family before they leave for Arizona. Here they have been in NY and I have seen them once. I had hoped to spend Thanksgiving with them but they have been sent to school for two months. Andree Morgana was to arrive at 5 same as when Rick needs to board but her plane was late and so it created difficulty in getting her. The meeting was good but a lot still did not get discussed. Then we got an hour of drumming before everyone took off. Both David and I are feeling somewhat melancholy as this all draws to a close. October 10 David had computer work still to do so I left with Pam and Lou for the sweat. It is different than what I am used to. That I expected. After wards, it rained so we did not get the display set up. I guess the highlight of the festival was after all the prayers in the water were given, at the end of the day, David, John Sardella, and Sean Kennedy put the bowl with the prayers in it, into the canoe and paddled out to the Lake. As cheers went up from the crowd as they poured the healing water into the Lake, then the crowd spontaneously broke into song, "Give Peace a Chance". 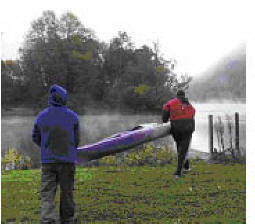 The men paddled back with the chorus. Everyone was elated. Most people considered it a music fest as many of the other areas were underdeveloped. David had many ideas but not enough man power or time to develop the programs… also some who said they would help and do things, failed to show. But all in all, everyone was excited about it and felt good about the outcome. A first time event is hard to do, but to have so many people come at the start in spite of the cold and stay until the end spoke for its self. It was a great day and one whale of an accomplishment. I presented my two paintings as Peacemaker Awards…. Ones that I wonder how we will match next year and in the future. The Awards go to the Onondaga for the work of Leon Shenendoah and to the Grafton Peace pagoda for Jun Yasuda. October 12 David wants to check on two meetings about the sewer situation in Syracuse so we spend the afternoon doing that. October 13 David did computer again until noon, then had another discussion with Andree and then we visited Leiko at Parks department about next year, and we visited Joanne at Co-op to make sure she felt good about the event. She is planning on participating in a larger way next year. We drive to Albany. The drive home is entertaining. David is full of quips and is fun to be with. Some serious discussion but all in all it makes the ride home seem faster. October 14 Mixed emotions today. Parts of me want to stay.... Parts of me want to just get the "hell out of dodge"e.
Everything has come true almost. But now I am left with unknowing again about my future. I have a divorce to take care of and I have 3 wolves that need a home. Everything here is going and I feel that I am a part of this and I should be here. But there is no sign from above as to the next step. Patience. Perhaps. David has been an education all by himself. For all his brilliance, intellectually and spiritually, he is still human and things get tuff sometimes in relationships where we spend so much time together, even more so I think when we are not a couple. Or maybe it would not make any difference.... David is David.... Actually in retrospect…. David is an exceptional human. We get along well. We work together very well, I feel. And if David worked on the couple of things in his human nature, he would begin to walk on water and then what would us earthlings do? Is that not what the journey is about?